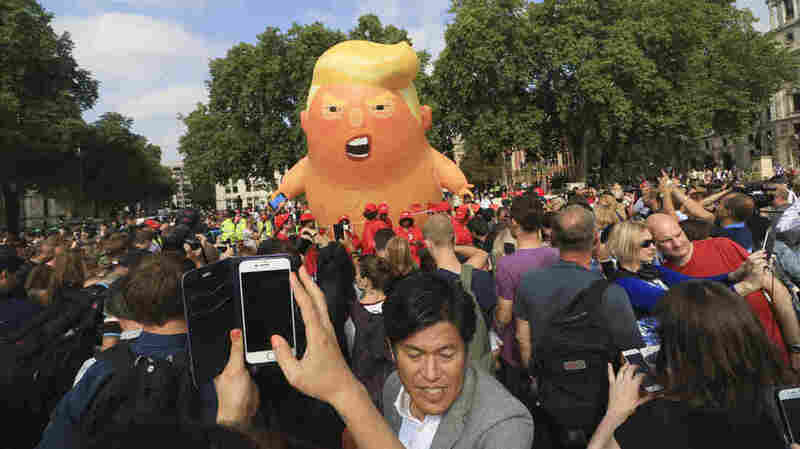 Large Protests, Baby Blimp Greet Trump In London And The U.K. The president tells a British tabloid that he feels "unwelcome" in London. He also attacks London Mayor Sadiq Khan, who approved protesters' plan to fly a "Trump Baby" blimp. A protest against President Trump in London's Parliament Square includes a giant balloon of "Trump Baby" in a diaper on Friday. It flew high above the statutes of prominent historical figures including Winston Churchill, Mahatma Gandhi and Millicent Fawcett. A large-scale demonstration began at 2 p.m. local time, or 9 a.m. ET. As he has done in the past, Trump also targeted London Mayor Sadiq Khan, who approved the protesters' plan to fly a "Trump Baby" blimp. It was a matter of free speech and protest, even if it offends someone, Khan told NPR's Mary Louise Kelly, adding that both Americans and Britons should be proud of that tradition. "The key thing is, it should be done in a peaceful manner; it should be good-spirited," Khan added. Trump acknowledged that he knew about the plan to float a blimp caricature, telling The Sun, "I guess when they put out blimps to make me feel unwelcome, no reason for me to go to London." The blimp depicts an angry-looking Trump-like figure in a diaper; a cellphone is clutched in its right hand. The protest balloon's launch drew a large crowd to London's Parliament Square, and media outlets covered the process of the baby blimp being inflated and lifting off into the sky. One man in the crowd held up a sign addressed to Trump that read, "You know your name means fart here, right?" An old slang term, "trump," has gained new prominence as the American politician rose to power. The baby blimp was airborne for around two hours, before it was deflated and stowed in a bag. Another elaborate protest saw a "Dalek Trump" — a version of the robotic bad guys from Doctor Who, customized with a red tie and blond wig — patrolling Whitehall in Central London amid a phalanx of mock security agents. Security teams have put massive preparations into place for Trump's visit. The U.S. Embassy in the country's closest ally warned Americans to be aware of their surroundings and keep a low profile during the demonstrations in both England and Scotland (where Trump will spend the weekend). And London's The Evening Standard says a "ring of steel," or temporary fencing, has been erected around Parliament to keep protesters at a distance. Many of the president's British critics are calling on May and other leaders to confront Trump "and take a firm moral stance" against his policies, as one organizer told NPR's Alice Fordham this week. Chief among those policies is Trump's program of separating migrant children from their parents at the southern border. Despite an easing of that policy, many of those families remain divided, detained hundreds of miles apart. Trump's trip to Britain had long been anticipated. It comes after a trip that had been planned for February — to officially open the new U.S. Embassy — was canceled. When he was asked about the planned protests, Trump said on Thursday as he prepared to fly to Britain from a NATO summit, "I think they like me a lot in the U.K. I think they agree with me on immigration." More protests are scheduled for this weekend in Scotland — where there are no signs that the public reception will be any warmer for Trump. Glasgow-based Tennent's brewery is joining those who have treated the American leader with derision. Directing a mocking tweet at Trump — a message that also promotes the brewery's new small cans — Tennent's posted a photo showing a small hand reaching out of a suit (with a U.S. flag cufflink) for a beer, beneath the slogan "Tiny cans for tiny hands." And The Scotsman newspaper published an op-ed in which it stated, "the 45th U.S. president is an appalling human being." The paper went on to say that Trump "is a racist, a serial liar, and either a sexual abuser or someone who falsely brags about being one." Trump's schedule on Friday includes another meeting and a working lunch with May at Chequers — the prime minister's country house — and a visit to Queen Elizabeth II at Windsor Castle, where they'll have tea. According to the White House schedule, from the moment Trump and first lady Melania Trump greet the queen to the moment they leave for the castle's landing zone to begin their trip to Scotland, the royal visit will have lasted an entirety of 40 minutes.